Network management and control - Our cloud has been intelligently designed with SmartZone as its core service, acting as a converged wired and wireless controller for Ruckus networks, providing Networking-as-a-Service (NaaS). The service offers a scalable cloud-based enterprise wired and Wi-Fi management to organisations of all sizes. Converged management dashbard for your wired and WiFi infrastructure. Manage thousands of WiFi Access Points across multiple locations. Easily configure and manage your wired network switch infrastructure. Use Role-Based Policy Management to secure wired and WiFi clients. The Dashboard is a customizable and contextually rich interface that reduces the time required to support largescale networks. Consistent menus and consolidated and streamlined navigation shortens time to perform routine tasks such as AP configuration or monitoring and switch monitoring actions. Configurable visual filter settings for the Dashboard personalize visual network alerts and statistics; settings are preserved throughout subpages. View maps, health and traffic analysis, spectrum analysis, and more. URL Filtering for wireless clients allows businesses to create and enforce content policies that protect users from inappropriate and harmful websites while maintaining access to allowed URLs. Policies are granularly applied at a wireless LAN or user group level with override whitelist/blacklist options. Rich dashboards provide real-time visibility into millions of URLs, classified into 83+ categories, being allowed or denied. Additionally, URL Filtering supports Safe Search for Google, YouTube, and Bing. Granular role-based policies for wireless clients enable the creation of policy groups segmented by user role, domain, location, OS type, certificate status, VLAN and many more factors. Roles are assigned during the authentication phase of new user onboarding, then VLAN, OS, and L3-7 policies are assigned as desired. Policy enforcement actions include allow, deny, and rate-limit based on VLAN or VLAN pool and L3/L4 Access Control Lists (ACLs)..
With Maps, centrally view all sites at the same time with Google Maps integration and display sites, floorplans and APs on the map. Simplify routine checkups of AP health on a siteby-site basis with one click. Inspect the status of APs across floorplans to find online, flagged, and offline APs. 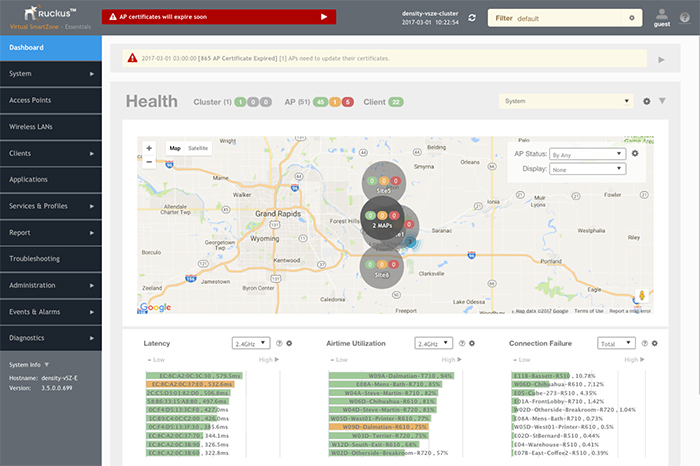 View health and traffic data for each AP to evaluate site performance. Administrators can choose an AP to view details like health status, IP address or other operational metrics. APs are colorcoded by status, and administrators can overlay operational data—like operating channel, traffic, client count, airtime utilization—for each AP on the map.. Robust Layer 7 application recognition and control for wireless clients pinpoints top applications and top users, among other metrics. SmartZone allows rate limiting, blocking and QoS actions by application to support organizational network usage policies. The application signature database is updated independently of SmartZone firmware upgrades, ensuring that administrators can always manage and control the latest applications. View rich statistics on subscribers (including client fingerprinting), APs, SSIDs, switches, backhaul (mesh), and the SmartZone cluster itself, with granularity as low as three minutes. Reports encompassing durations of hours to weeks can be generated for a variety of key performance indicators (KPIs) and exported in multiple formats. For operators seeking richer information, the Ruckus SmartCell Insight (SCI) network analytics tool provides for long-term data storage, data analytics and more complex reports. Interested in migrating to our cloud hosted SmartZone? For a limited time, we are migrating existing Ruckus ZoneDirector customers for free. To enquire please call 0800 310 2050. Ruckus Networks are not only a leading WiFi vendor but now a leading wired vendor with the introduction of their ICX range of cloud managed switches.